Seeing as San Diego shares a border with, uh, Mexico, it should come as no surprise that it’s also home to some of the best Mexican food in the whole United States. Where San Diego’s specialty lies, however, is in that proximity to the border; high-quality Baja-style cooking is at a premium here, with somewhat less representation of other regional Mexican cuisines than you might find in some other cities with strong Mexican identities (looking at you, LA). That shouldn’t deter any serious eaters looking for exceptional Mexican dishes, though. Baja-style seafood is ubiquitous here, whether that comes in the form of a fried fish taco or a raw shellfish cocktail. 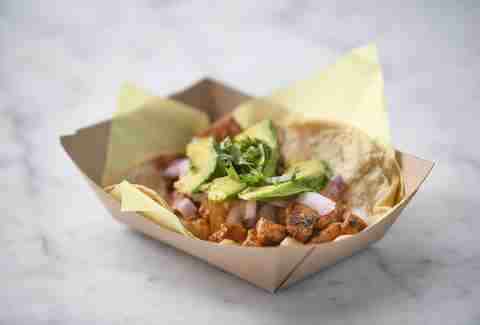 San Diego also has the lock on street tacos, a special kind of lobster dish, heirloom corn tortillas, and one of the best agave bars in the United States. Behold: the best Mexican restaurants America’s Finest City has to offer. Super Cocina seems like another unassuming storefront in City Heights, but what isn’t obvious on the surface becomes so once the food is sampled. The cooking here is more like what you’d find in a Mexican home than a traditional restaurant, with dishes like chicken in cilantro sauce or pork in a chile Colorado sauce often featured alongside red or green posole. 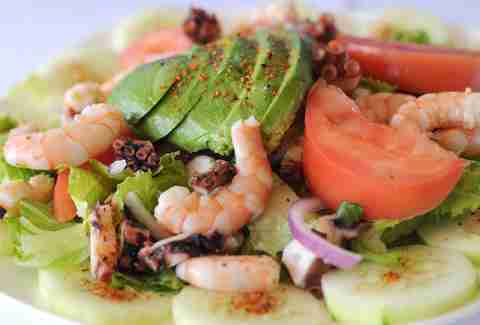 Super Cocina also caters, which means you can bring its bright flavors to homes all over San Diego. Tijuana is famous throughout Mexico for its culture of high quality street tacos -- mostly various meats like adobada, or marinated pork roasted on a spit; carne asada; cabeza, or head; and lengua, or tongue, all served in two palm-sized, griddled corn tortillas with cilantro and chopped onions. The best tacos you’ll find in San Diego are the ones at Tacos El Gordo, which has a separate line depending on which meat is desired -- so, if you’re looking to pick up multiple types, the best move is to come with a group and split accordingly. TJ Oyster Bar specializes in seafood, especially the raw and marinated kind. Here, Baja-style tostadas and cocktails are piled high with raw seafood, ceviches and aguachiles, and cooked tacos with fried fish, smoked tuna, stingray, and garlic shrimp are also popular. Galaxy Taco in La Jolla Shores serves a variety of classic and updated regional Mexican dishes, ranging from tostadas, to tlayudas, to grilled fish, alongside a stacked craft cocktail menu with plenty of agave spirits involved. 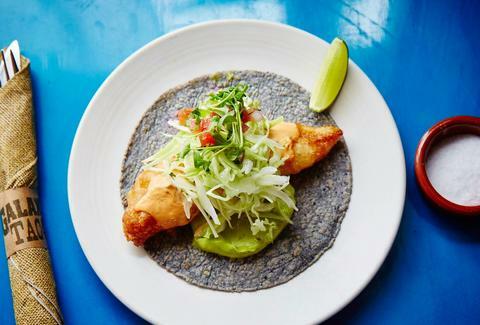 What’s particularly special about Galaxy Taco, though, is its tortillas: they’re made in-house, using heirloom blue corn sourced from small-scale farms back in Oaxaca. 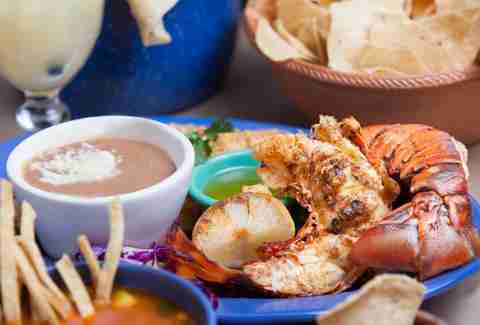 Just south of Rosarito in Mexico is the lobster village of Puerto Nuevo, where visitors can eat fried or grilled spiny lobster with a side of cold beer, rice, beans, and flour tortillas. Ortega’s is one of the best restaurants in Puerto Nuevo, and luckily for us, it’s opened up shop in San Diego serving exactly the same fare alongside an expanded menu with other Mexican dishes, like its famous queso fundido. El Comal is a cozy, homestyle Mexican joint in North Park that’s particularly loved for its thick, homemade corn tortillas, enchiladas, gorditas, red or green pozole, and variety of other regional Mexican dishes. This place also has a long cocktail list, with many different kinds of margaritas, micheladas, and other Mexican drinks, as well as a happy hour special where beer costs just $3. San Diego operates as the home base for fish tacos in the United States, seeing as they were invented just down the road in Ensenada, which is about an hour and a half south of the border. There are many places to find great ones in San Diego, but local mini-chain Oscar’s churns out a perfect version of the classic fried fish in a corn tortilla with cabbage, chipotle mayo, crema and salsa bandera. Head to their Pacific Beach location, which is right next to the ocean, for maximum effect. The menu is short and fixed at Las Cuatro Milpas, a so-called hole-in-the-wall in Barrio Logan, but the lines are always long, and the food plentiful. Come here for hard shell pork tacos, rolled tacos and bowls of chorizo with rice, beans, and flour tortillas (made in-house). There’s not much else to know about this San Diego cult favorite except to show up, have your cash ready, and order greedily. 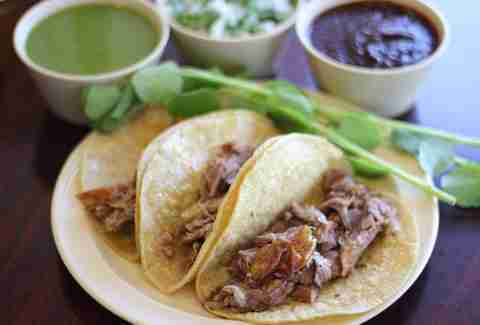 Hailing from the small, rural town of Texcoco, the appropriately named Aqui’s specialty is barbacoa-style lamb -- it’s the no-brainer choice, available in plate, taco, and even pita sandwich form. Those looking to go a little deeper will find other hidden gems, including tacos filled with crickets, huitlacoche (a kind of corn fungus), lamb brain, and blood sausage. But seriously, though, make sure you get the lamb. San Diego’s best -- and simplest -- margarita can be found at Cantina Mayahuel in North Park. That’s not really the stand out, though; what should be the focus are its over 200 agave spirits, including an extensive list of tequila, mezcal, raicilla, sotol, and bacanora. 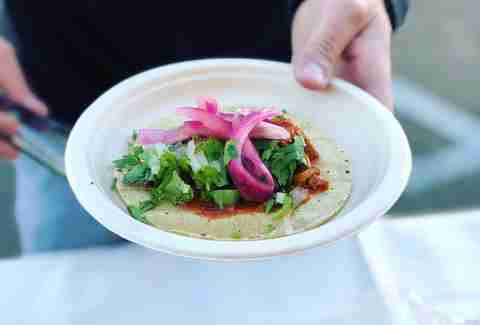 A limited-but-delicious cantina-style menu is offered, of which the carintas is absolutely not to be missed. This place fills up around dinner time, but there’s ample indoor and outdoor seating for those who just want to get their agave on.